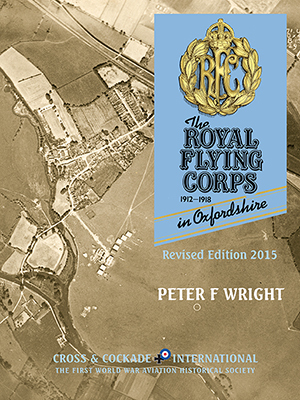 This revised and expanded edition will give new readers some idea of the part played by the emergent Royal Flying Corps in the history of early aviation in the County of Oxfordshire. Certain civilian fliers had also been active at the time, but this history concentrates solely on Service flying and training, carried out by our early military aviators. The booklet purposely does not go into minute detail of the day-to-day activities of these airmen, but is intended to present, both to the enthusiast and the general reader, a broader picture of military aviation in its formative years in and over the county. The story eventually leads to, and includes, the first test of the aeroplane as a weapon, in the Great War of 1914 to 1918. The booklet deals mainly with the Royal Flying Corps, which developed earlier from the Air Battalion of the Corps of Royal Engineers (1911/1912), and on 1 April 1918, finally became the Royal Air Force. The story is one of conscientious endeavour in the face of unknown dangers and well illustrates the pioneering spirit inherent in these brave airmen. Published 15 September 2015 to coincide with the exhibition Above the Dreaming Spires at the Soldiers of Oxfordshire Museum, Park Street, Woodstock.